First timer or experienced skier, this cross-country skiing expedition trip presents an unforgettable experience for any adventure-minded nature lover. 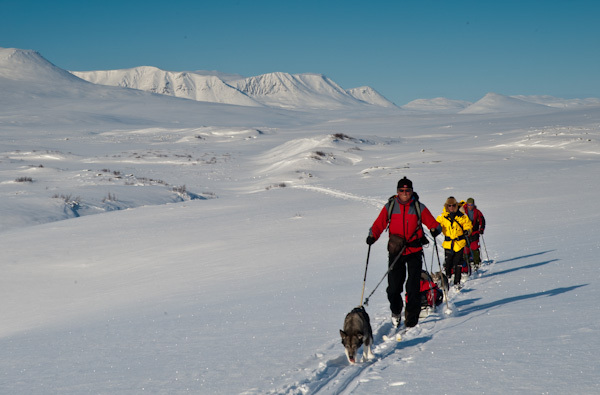 On this expedition trip we ski with dogs and pulks (sleds) from outside the town Alta, southeast, across the Finnmark Plateau to Karasjok in the heartland of the Norwegian Sami culture. We sleep in mountain cabins and tents and most of the trip will be of trails. 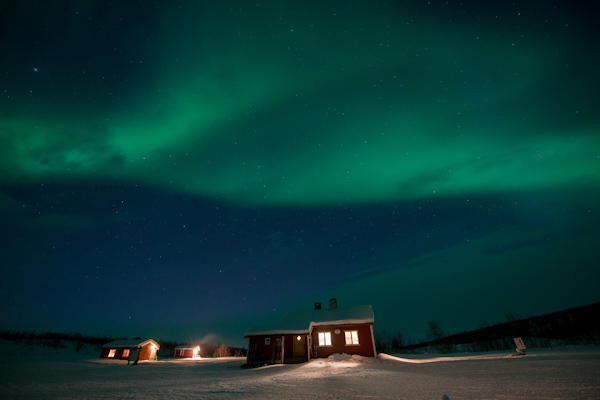 From mid March to early May is probably the best time to see the Finnmark Plateau. The dark polar night is over and the light returns with higher temperatures and longer days. The skiing conditions are normally excellent, making it easy to get to almost anywhere you want to go. The weather is often good and the ice fishing gets better every day. We leave the hustle and bustle of civilization behind and we focus on making this a stress free outdoor experience. Every day brings new scenery as we ski across wide open plateaus, over hills and around mountains. We take the time to enjoy the environment and to make our tent camps as comfortable as possible. On our way we will also try ice fishing. Your very experienced guide will make sure safety is taken care of at all times. 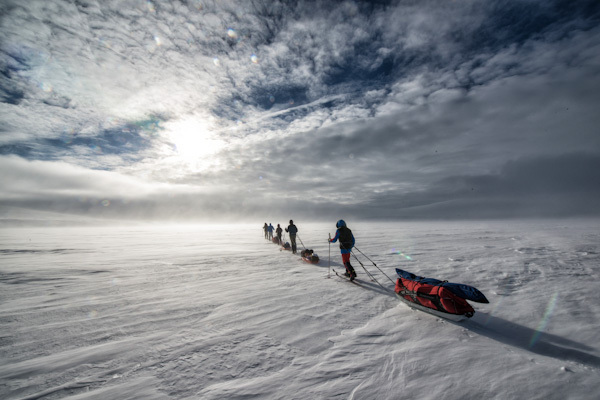 We will be cross-country skiing the whole way and we transport everything we need in pulks and backpacks. Dogs will help us pull some of the equipment. 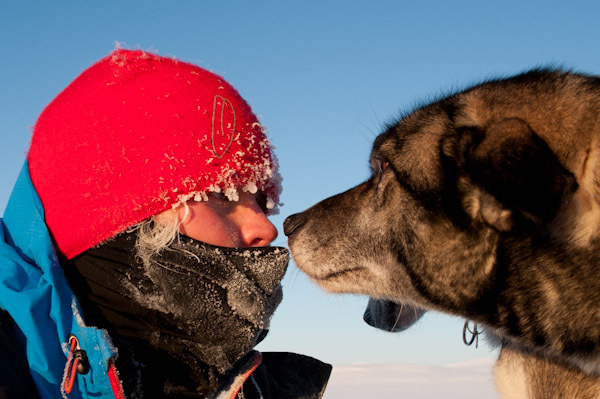 These happy, social and hardworking Alaska Huskies give the trip an added social dimension. Your guide will show you how to handle the dogs in the best way possible. Our daily skiing distance is between 4 and 15 kilometers. Total distance is approx. 80 km. The terrain is open, flat and easy to ski across. The weather is normally good with cold nights and "mild" sunny days. The Arctic weather, however, can sometimes present some challenges. But do not worry! Your guides are highly professional and have years of experience in this environment, he/she will make sure you are well taken care of in any situation. On this trip we focus on comfort, good food and, as with all Turgleder trips, safety. 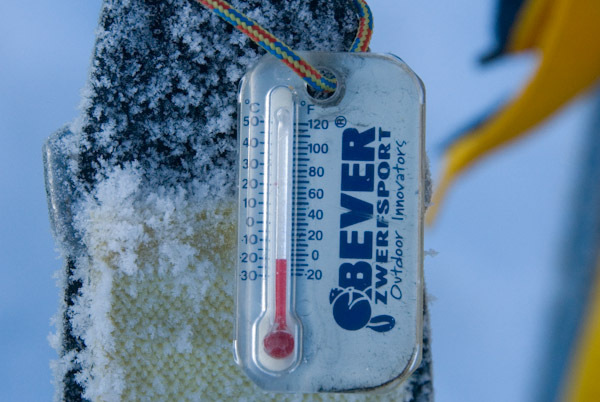 You do not have to be an experienced cross-country skier to do this trip. Several first time skiers have already done it. However, if you wish to learn the basics of skiing or improve your cross-country skiing skills before you go, we can offer you a skiing instruction program at 10am in Alta, day one of the expedition. A reasonable level of fitness is necessary and some outdoor experience is helpful. The German Spiegel Online (published December 2014). The Nerderlandske Hoogtelijn, (published November 2012). 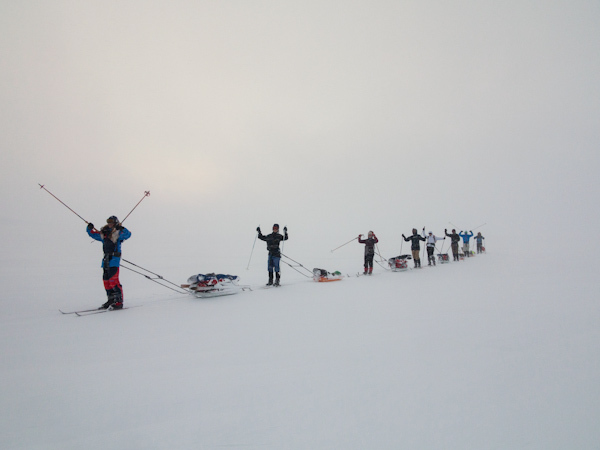 About our skiing trips on Northern Norway tourist board. - Temperatures can drop down to approx. -25 C.
- Sunrise around 6am on 15th March and 4:30am on 15th April. - Sunset around 5:30 on 15th March and 9:30pm on 15th April. Day 1 Arrival in Alta, supper, briefing about the details of the trip and checking your personal equipment. Lodging at guesthouse/cabin. Day 2 Packing the equipment and starting the trip. Lodging at Jotka mountain cabin. Day 3 - 8 Skiing across the Finnmark Plateau. Sleeping in tents and last night in a mountain cabin. Day 8 Arrival in Karasjok and Lodging at Engholm Husky Lodge. Sleeping in design cabins. Arrival in Alta. Your guide will meet you at Alta Airport at 6 or 7pm or in Alta city and take you to a local guesthouse/cabin where you will stay the first night. You will be served dinner and your guide will go through the program for the trip and the exact skiing route with you. 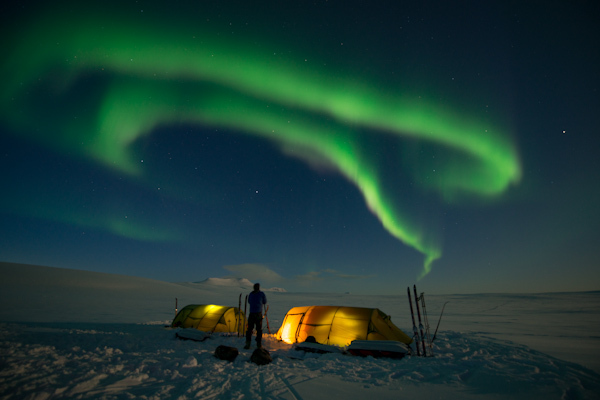 Your guide will also go through your personal outdoor equipment to make sure everybody has brought everything they need for the trip and that the equipment meets the standards that the Arctic environment requires. After breakfast we will do the last preparations and there will be time for some last minute shopping before we travel to the mountains where the trip starts. We start of easy on the first day with skiing only approximately 4 kilometers to the Jotka Mountain Cabin. Here you will be served dinner and stay for the night. In the afternoon you will be teamed up with 1 or 2 other people with whom you will work together and share a tent during the trip. You will also be shown how to put up your tent and how to use some of the equipment that you will be using on the trip. 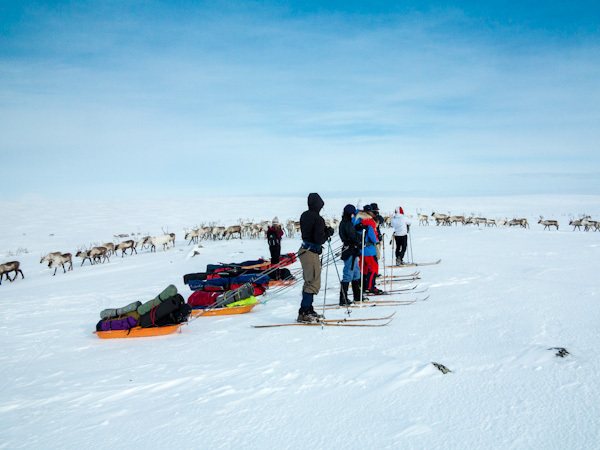 There will also be time to make your final personal preparations and adjustments before the journey across the Finnmark Plateau starts. 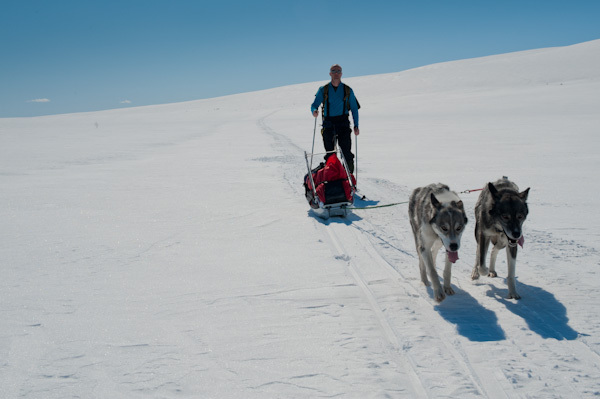 The guide will also go through safety routines, skiing routines and how to handle the dogs in the best way possible. After breakfast the trip starts. Alaska Huskies will help us pull some of the equipment. You will be surprised to see how much these dogs love to work. We will be skiing half of the day on tracks and the rest of the day off tracks. This evening will be the first night in tents. We will now be well on our way and the landscape will be quite flat and mostly treeless. A new day on skis. The next camp will be set up by a good fishing lake and the rest of the day can be spent fishing on the ice if we arrive early. 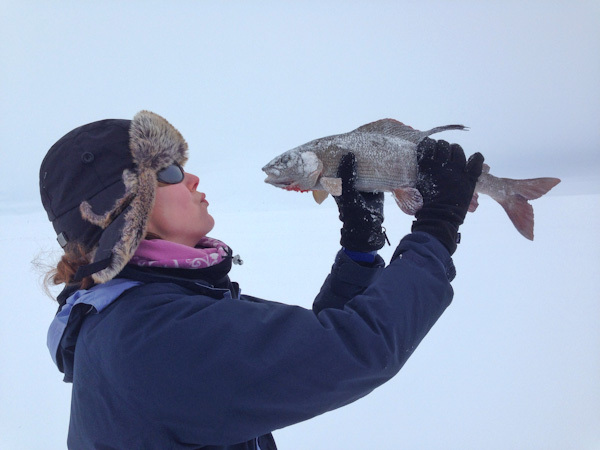 The lakes along our skiing route have mostly Arctic char, Brown trout and grayling. With some luck, we will catch some that we can prepare for dinner. The day starts slowly and if you like you can try some fishing again before lunch. After lunch we pack our camp and we ski the rest of the day before we make camp again. The first kilometers will be in gentle uphill terrain before we reach the highest point on the trip. Here you can enjoy a fabulous view and there will be time to take out your camera before we continue. 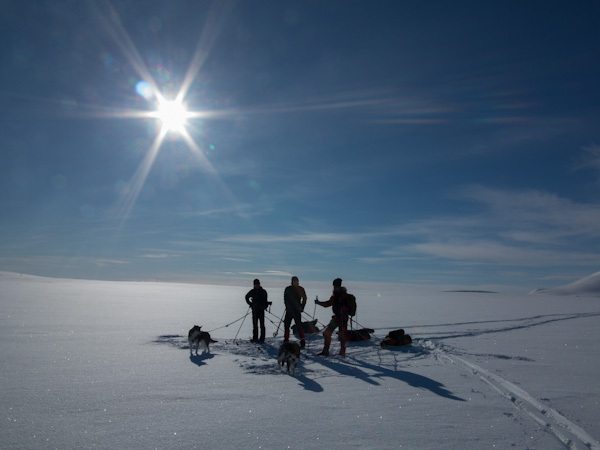 We will be skiing a few more kilometers before we make camp for the night. During this day we will be going from the barren mountains down into the forest. We spend this night at Ravnastua mountain cabin. This mountain cabin has a basic standard with no shower facilities. It is heated with wood burners and there are no televisions or other things to disturb the cozy and relaxed atmosphere. You will be sharing a room with your trip mates. We will be skiing the rest of the way to Engholm Husky Lodge. The 15 kilometers will be on tracks and mostly downhill. After our arrival at the lodge we will gather in the lodge kitchen and dinner will be served in the warm and cozy lodge atmosphere. A nice wood heated sauna and outdoor hot tub is ready on request for those tempted. Under "General information" and "getting here" you will find information about how to travel from Karasjok to prefered airport. Are available on request from January to May. 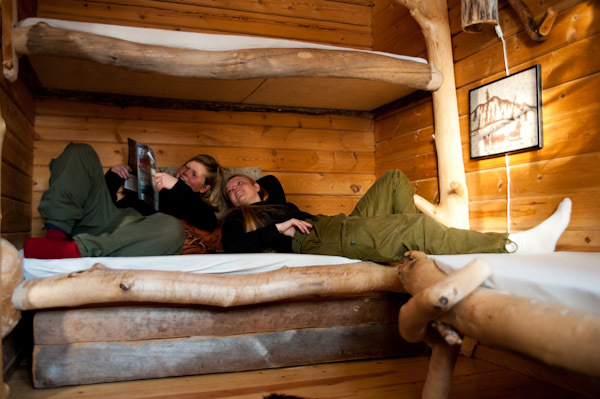 · Lodging in doubleroom in Alta, Jotka, Ravastua and Karasjok. - You must be prepared to share rooms in Alta, Jotka mountain cabin and Ravnastua mountain cabin. In Karasjok you will be lodged at the truly unique Engholm Husky Lodge in double rooms in design cabins with one or two rooms. - First night in Alta and last night in Karasjok single rooms are available for an additional cost. For lodging prices and options, please go to the "Lodging" tab.